More and more, we're hearing the term "Digital Citizenship." I think we should simply call it "Citizenship." In our increasingly connected world, what it means to be a citizen is contextualized by more than just our countries and communities; we are global citizens. Part of being a citizen these days is manifested in what we do digitally, and because of that, I will adhere to the term "Digital Citizenship" -- for now. I hear parents, teachers and community members talking about their concerns over their children's online behavior, and rightfully so. I believe it is our job as educators to teach and assess Digital Citizenship, and I also believe PBL is a great way to target this objective in an engaging and authentic way. The ISTE Student NETS #5 is itself called Digital Citizenship. As you build a PBL project, look at the quality indicators articulated below. If you want, unpack the standard more to include other quality indicators. These will help you in creating clear targets that students will understand and can achieve. From these learning targets, you and the students can create rubrics which can be used as reflective tools, and ultimately assess a final product in a PBL project. The more students understand and use these tools, the more they will internalize the language and understand what it means to be a digital citizen. b. Exhibit a positive attitude toward using technology that supports collaboration, learning and productivity. This is a key piece. Start by asking yourself who needs this information and would find it useful. This will lead to an authentic audience. From there, what is your purpose? In the ISTE NETS excerpt above, there are many examples such as advocacy and exhibiting. But beyond that, students can create awareness, solve a problem, design a program and more. This authentic purpose will help you focus the inquiry and create a driving question that is purpose-driven and in student-friendly language. A Digital Citizenship PBL project is an excellent opportunity to partner with the teachers of other content areas to teach and assess multiple standards. If you are the technology teacher, you can use this opening to build in some ELA reading and writing standards. To make sure it fits and that you are picking products that will assess the standards, read my blog on Integration Strategies for PBL. While the content for the PBL project is Digital Citizenship, other content standards can be built in, especially those that are skill-based. Students can write guides for the school or even advocacy letters. In addition, students might analyze related data, or engage in social studies research. A PBL project can be an intentional and meaningful place to engage students in understanding digital citizenship. It can target learning in multiple subjects and help arm our students with the skills to make the right choices in our increasingly digital world. 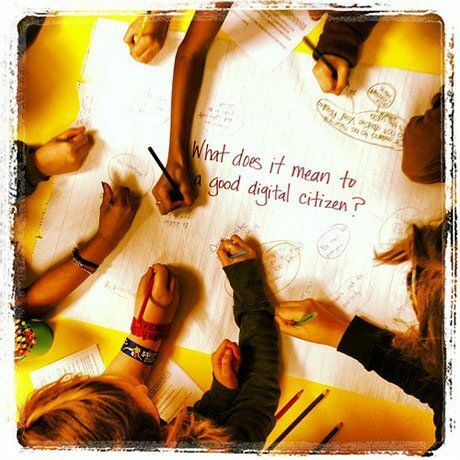 What Digital Citizenship PBL project ideas do you have? Share and collaborate.